Emigration The exodus prompted by the Great Famine can be seen in our Immigration & Travel records. Census Find out how your ancestors fared in the post-famine years by tracing them in our Census record sets. Crime Did the Famine create a crime wave? Search our records to find out. Land Understand how the relationship between landlords and tenants was at the heart of the Famine. DirectoriesWhat can a directory tell us about the welfare response at the time? Read contemporary reports from the time of the tragedy in our Newspaper collections. Newspaper accounts address all aspects of the famine,or as many describe it ‘distress in Ireland’. 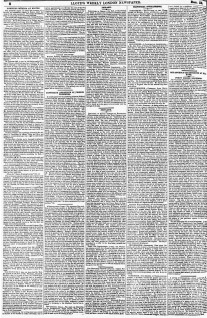 The proliferation of newspapers in the mid-nineteenth century is a great boon to the family historian and the ‘who, when, what, where, why’ reporting style makes them a very name rich source. National newspapers received a lot of their content from the regional press, giving us access to local news even where those smaller newspapers do not survive. 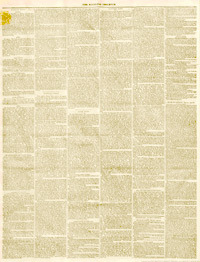 The coverage in the newspapers is comprehensive and addresses all of the major issues surrounding the famine and the culpability of government and landlords in prolonging and exacerbating the plight of the millions of rural labourers and tenant farmers who were among the worst affected by the tragedy. Other reports focus on the human stories. Click on the images to read full newspaper reports. One report from Kilrush, Co Clare published in December 1849 by the Lloyd’s Weekly Newspaper gives a detailed account of the tragic drowning of 41 people travelling on a ferry back from Moyarta. The people on board had been travelling in the hopes of getting ‘outdoor relief’ – that is some form of donation of food or clothing without being resident in a Workhouse. Another story from Clare published in the Liverpool Mercury in 1848 concerns 4 women, including a mother and daughter who starved to death in a house near Ennis. A subsequent inquest found relieving officer, James Lynch, guilty of their deaths due to ‘gross neglect of duty’. The Stirling Observer newspaper in April 1847 recounts the story of a police officer who saw a poor man, John Callaghan, on crutches resting against a wall in White Street, Cork City. On approaching the man, the officer realised he was in fact, dead. In his pocket John carried an admission slip into the local infirmary and was most likely on his way there when he died. The newspaper reports do not shy away from graphic details of the effects of starvation and the depredation on the bodies by animals. This sensationalist approach to reporting such harrowing events could be condemned but it also gives us a deeper appreciation of the very real suffering throughout the country. 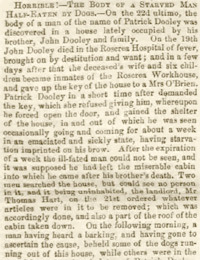 The account of one man’s death, Patrick Dooley of Roscrea in Co Tipperary published in July 1849 makes for difficult reading. As part of a Britain & Ireland or World subscription the findmypast newspaper collection can be searched by name and keywords (e.g. eviction, distress, famine) and further narrowed by date range.